Lunchtime gaming has been a wonderful surprise for me. The ability to play games during my work day has done so much to ease work stress for my friends and I. To make it even better, we’ve had 3 people who’ve never previously gamed at all join us. As wonderful as gaming at lunch is, finding games that play quick enough and are new-player friendly can be quite a challenge. We needed a game that would support up to 6 players and be done in about 25 minutes. Lucky for me, I was shown Mars Attacks: The Dice Game at a convention and I knew it would be a perfect fit for my group. 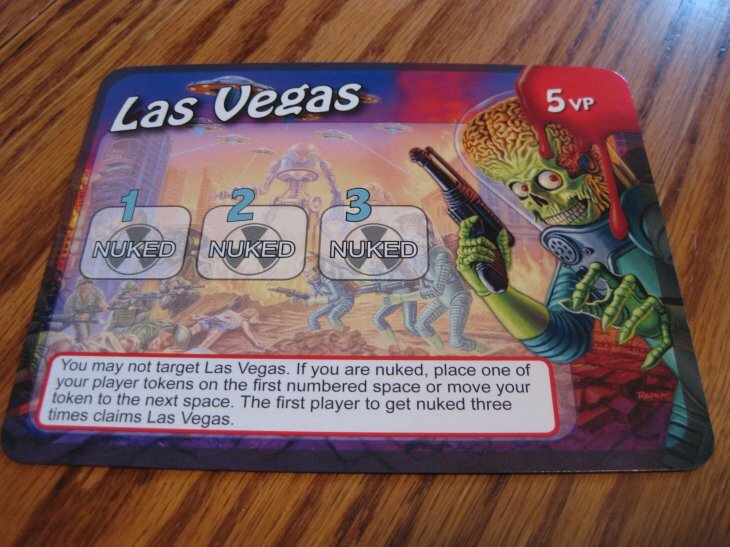 Mars Attacks comes with 29 location cards, 1 Difficulty card, 4 player tokens in each of 6 colors, a start player marker, and most importantly, the dice. 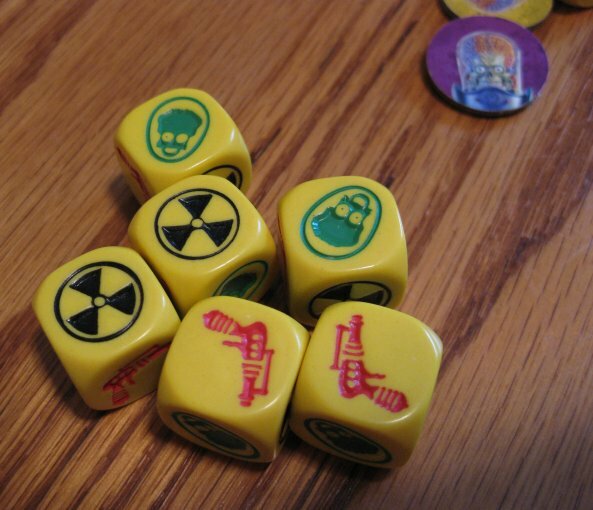 You get 10 of these awesome yellow dice. There are 2 nukes, 2 aliens, and 2 ray guns on each die. To start the game, you shuffle the locations and then make 4 stacks with 1 card per player in each stack. Place these face down and flip the top card. 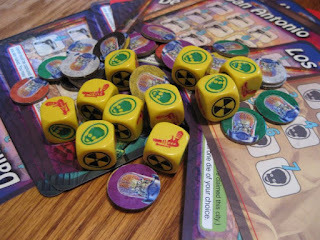 On a player’s turn, they pick a card to go after and roll the dice until they decide to stop or they bust out by rolling too many nukes. Busting out is half the fun of the game! Each location card may have up to two nuke symbols on it. There’s also the Difficulty card that has 1 nuke on the hard side and 2 nukes on the easy side. Count up all the visible nukes in the play area. If you roll that many nukes on your turn, you bust and get nothing. The number of nukes will change throughout the game which makes for an interesting ride. One round, it may be almost impossible to bust. Others, it may be really easy. The schadenfreude runs deep in this game. Watching someone fail miserably can be almost as much fun as winning a key card. I really like that there are two different kinds of locations. The Cities are the standard kind and have 3-12 spaces on them. To claim a city, you need to roll ray guns equal to that number. You get to re-roll until you bust or decided to stop. The Monuments are a bit different. These cards show Martian heads. You only get one roll each turn and what you get is what you get. This gives the Monuments a wonderful element of chance that creates some excellent swings of fortune. A few of the cities even have special rules for taking them to spice things up. Los Angeles uses nukes instead of Martians or ray guns. Detroit needs to be taken in one turn. And then there’s my favorite: Las Vegas. If Las Vegas is in play and you bust out, you put your token on it or move it forward if it’s already there. The first player to bust three times gets Vegas. It’s such a fun card. Completing a location usually takes multiple turns so you get great competition as multiple players race towards victory. The tension ratchets up as someone gets close because the losers get nothing and have wasted all their time while the winner gets the card which will give them victory points. It’s all or nothing so the stakes are pretty high. Some cards have special abilities which can either give you an instant bonus or an Ongoing power. What’s really awesome is that cards with powers are worth less victory points so you need to decide if you want big points or a bonus. When the card comes up in the game will also affect your decision. But if players are avoiding one card, that might be a great chance for someone else to get in there and steal easy points. You can see how this helps create choices, something that a lot of dice-rollers lack. The box says 3-6 players, but this game shines at the higher player count. The extra competition is awesome and the cards get crowded quickly. You have more decisions to make as to where you try to go which adds to the game. Turns are very quick so there’s not much downtime at all. The playtime of 20 minutes is pretty much spot on, even at the higher player count. 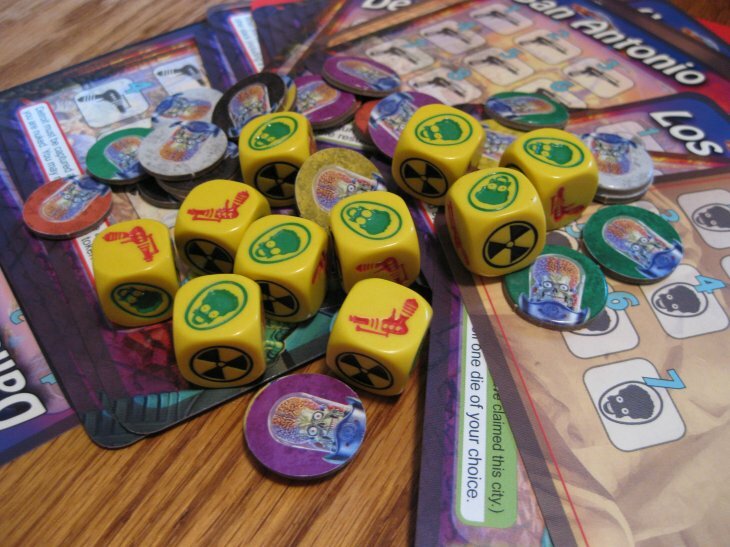 Steve Jackson Games’ biggest dice-rolling hit thus far has been Zombie Dice. 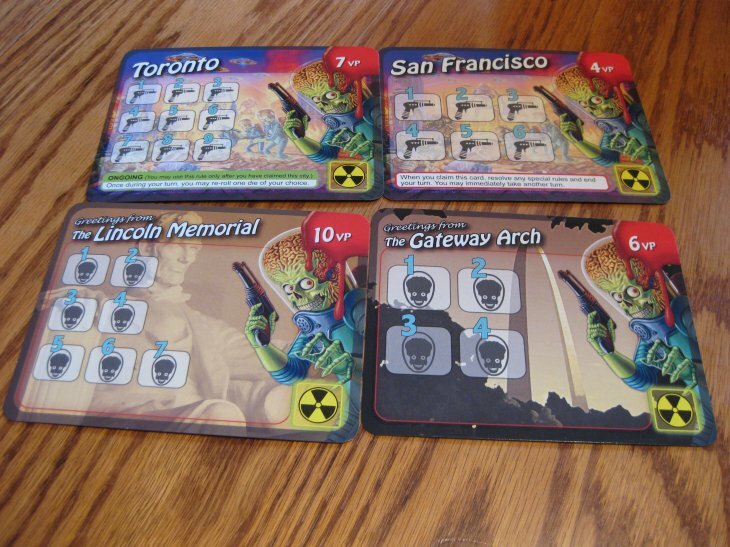 I personally like Zombie Dice, but with Mars Attacks around, it doesn’t get played. Mars Attacks trumps it in almost every way. Sure, it’s not quite as portable because of the cards, but it has more interaction which is a great improvement. The competition for the cards is exactly what I want in a dice game. I find that the special abilities, special capture rules, and different card types add a huge amount to what would otherwise be an overly-simple game. The extra development pays off big time, here. When you add in the fact that this plays 6 and plays in about 20 minutes, you have a winner. This game is absolutely perfect for a lunchtime game group or as a filler between games. The dice look great as do the cards. For about $20, you get a game that will play many, many times and it will always play differently. That’s a lot to ask for, but Steve Jackson Games delivered in a big way. This game deserves a LOT more attention than it’s gotten. With the right publicity, this could give Zombie Dice a run for it’s money as the king of SJG dice games. dice game is most popular game.in www.e-tabletop.com/ have many dice games are sell,buy and trade.